Some may consider visiting the scene of a nuclear accident to be a strange way to spend a few days off but I felt the need to visit, take photographs, and to tell the story. 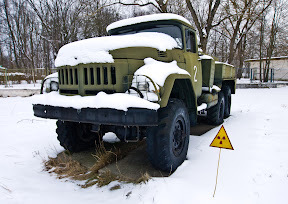 I’ve always been interested holidays that take me off the beaten track, and so when I discovered that you could take an organized trips to see the Chernobyl exclusion zone, and that I could use up some AirFrance miles to get to Kiev, I booked a trip. After a pickup in Kiev, we drove in a minibus around 120km north from the city to the edge of the exclusion zone. On the way though the zone we paused to take a look at the source of the Russian Woodpecker - a massive antenna known as Duga-3 that transmitted a mysterious signal on short-wave radio between 1976 and 1983. We weren’t able to get close - so I had to enlarge this image quite substantially to be able to see it clearly. 25 years ago, on 26th April, 1986 at 01:23 am Reactor Number 4 exploded, launching 9 tonnes of radioactive material into the atmosphere, which then drifted over much of Western USSR and Europe. As I understand it, the accident was initiated as a sudden surge occurred during a systems test. The operators attempted to initiate an emergency shutdown which only served to increase the power spike rupturing the reactor vessel and triggering a series of explosions. This exposed the graphite moderator to the air causing it to ignite, which sent a plume of radioactive smoke into the atmosphere. One of the major concerns after the initial explosion was that of a subsequent steam explosion. Beneath the floor of the reactor were a series of water reservoirs that comprised part of the cooling system. In addition to this water, a large amounts of water had collected from the fire-fighting efforts. The smoldering graphite, fuel and other material from the core, now at more than 1200 °C started burning through the reactor floor mixing with molten concrete from the reactor lining, creating corium, a radioactive semi-liquid material comparable to lava. If this had melted through the floor into the water below, it could have created a massive steam explosion that would have ejected more radioactive material from the reactor. The pool was drained by a couple of selfless volunteers in diving suits who managed to open the sluice gates from within the pool, and allowed the water to be pumped out. Even after this, there was still concern that the molten core would reach the water table below the reactor - so they initiated a plan to freeze the earth below the reactor with the injection of liquid nitrogen. After determining they would need 25 metric tons of this to keep the soil frozen at −100 °C, they scrapped this idea and filled the bottom room with concrete instead. Much of the radioactive debris surrounding the facility was collected by liquidators wearing heavy protective gear. Even with this gear they could only spend a maximum of 40 seconds at a time working on the rooftops of the surrounding buildings because of the extremely high doses of radiation given off by the blocks of graphite and other debris. To prevent further release of radioactive material a large concrete sarcophagus was erected to seal off the reactor and its contents. Many of the vehicles used in the clean-up are still highly radioactive and have been buried on the site. A few of the less radioactive were left above ground in this exhibition area for visitors to see. The roof of the sarcophagus was hastily constructed at the time, due to the need to prevent further leaks - and as such it was built resting on one of the walls of the reactor. Since then a vast frame of supports was constructed (2006/2007) that have taken the weight of the roof off the wall of the building. Even with the new supports, the sarcophagus still needs to be replaced - and the Ukraine are presently looking to find 740 million euros to create a large convex tunnel 100m high that can be slid over the existing reactor to allow them to start dismantling the existing sarcophagus. In April, they announced that the EU had committed another €110 million towards this project. This new shelter should protect the site for around another 100 years, by which time they hope to have developed the technology required to make the site safe. Why did the accident happen? Well, from my reading of the wikipedia content it seems that it was a combination of an old design which wasn’t completely fail-safe, and user/process mistakes that allowed the reaction to get out of hand. You have to remember that the Chernobyl reactor was commissioned in 1977, and developed in the 1950s, so this design hasn’t been used for a while. The Fukushima plants are second-generation, built in the 1960s, and aren’t being deployed today either. Today’s 3rd generation plants are a lot safer; and if you listen to Bill Gates, the upcoming 4th generation of travelling wave reactor (TWR) will easily be able to avoid most of Fukushima’s problems. This is primarily because they have better ways of dealing with the after heat that results after a nuclear reactor is shut down. Bill Gates is an investor in TerraPower - a company he discussed in his 2010 TED Talk - Innovating to zero!. They have created a prototype nuclear reactor that supposedly runs for 50 years without refuelling. At the recent Wired Business Conference, he pointed out that “If you compare [nuclear] to the amount [of people] that coal has killed per kilowatt hour it is way, way less.” The problem, Gates believes, is that deaths for which nuclear power plants are deemed responsible are concentrated around specific events and times. “Coal kills fewer people at one time, which is highly preferred by politicians,” he said. Even better - the TWR runs on waste uranium, a byproduct of current reactors. A small amount of enriched uranium is required by the reactor to get started, but it then runs on the waste, making and consuming its own fuel. The benefit of this design is that the reactor doesn’t require constant refueling and waste removal. It can run — it is thought — for decades without refueling. This, the companies currently working on a TWR design insist, makes nuclear power safer and cheaper. Bob Cringely also makes mention of a Toshiba 4S reactor design that is built on a construction line, transported to site then installed 30 meters under ground. Each unit puts out 10 MW of electricity (suitable for 2000 homes) for 20 years, and is then returned for refulling. They are ‘pretty darned impossible to melt-down’ - and if compromised automatically shut down and sit there. I buy Bill’s pitch that nuclear is the only real solution to the problem of the greenhouse effect, and believe that with suitable design and engineering that we can develop fail-safe nuclear power with no dependence on humans in the system. Prypiat was constructed in 1970 less than 3km from the reactors to house the workers for the facility, but it wasn’t evacuated until a few days later. It took until the night of the 26th for the decision to be made to evacuate, and until 14:00 on the 27th before the evacuation began. 53,000 people were evacuated to various villages around the region. Residents were told to bring only what was necessary, as the authorities had said it would only last approximately three days. As a result, most of the residents left their personal belongings, which are still there today. We visited a number of the buildings within Prypiat, including the cultural center (above), the hotel, an apartment block, and the swimming pool. In most places the buildings were in ruins, having been looted of anything valuable over the years; and the trees that are omni-present throughout the city are beginning to reclaim the area. Within the school there was plenty of abandoned books scattered across the floor. I even spotted one about Dimitri Mendeleev - the creater of the periodic table of elements. The photograph of the gas masks above was also from the school - as preparation for a cold-war US nuclear attack. Only once radiation alarms were triggered at the Forsmark Nuclear Power Plant in Sweden on Monday 28th April, over one thousand kilometers from the Chernobyl Plant, did the Soviet Union admit that an accident had occurred, however the, authorities continued to attempted to conceal the scale of the disaster. 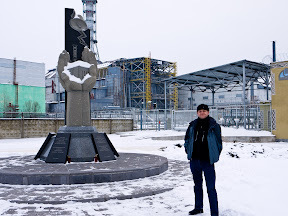 You can see the highlights of my Kiev and Chernobyl photos in my image gallery, or checkout the slide-show below, or view them in-situ on the Google map below that. You can also view the images, key waypoints and photos in a full screen preview, or download the KMZ file yourself for use in Google Earth on your desktop.